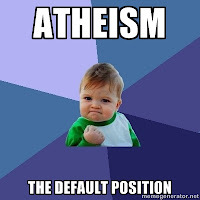 Many atheists claim that atheism is the "default position" in the mind at birth. In other words, they claim that each human being is conceived as an "atheist." Atheists seem very convinced of this claim; however it is fallacious. I will briefly refute this claim by showing that it is not possible. All human organisms are conceived when a sperm and egg unite. At conception, a new human being is created with its own genotype and phenotype. However, no human being is born with an infused intellect or conceptual knowledge. No person is born having acquired knowledge from stimuli outside of the womb. Studies show that unborn children do have memories; however, these memories most likely are related to what the child has experienced in the womb. All human beings are born with "tabula rasa," or a "blank slate." There is no information in the brain in regards to experiences while living on Earth because the human being has been in a womb for 9 months. Even after birth, the brain still does not have experience and needs those around in order to learn. Babies need to be taught even the simplest of things in order to survive. The human being is the only organism that needs this attention. Other organisms instantly know what to do and how to handle their environment the moment they are born. A human baby will die if left alone and its needs are not met. Being that human beings are social creatures, they learn about society via interaction. Each culture presents to the individual what are called Social Scripts, or how to behave within a society. These are nurtured and are not part of nature. Atheism is a social phenomenon and therefore cannot be the default position. It must be learned. Atheism is a social script, not a default of the human condition at birth. No one is born atheist or possesses an absence in belief of God. In order for one to not believe something, one must be first aware of that something. 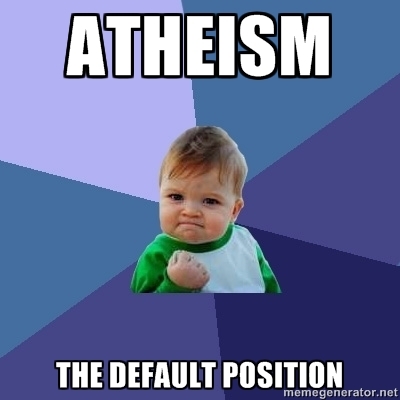 Therefore, atheism as default fails. It still works as a default, but you're looking at two different stages of atheism, first when you don't know of gods, and second when you do you reject the idea, both are still equally atheism. Same as when you are a baby you are pizzaless, until you grow up and are offered pizza and decline, you are still pizzaless, you don't acquire some new type of pizzalessness. Not knowing gods is not atheism. You are confusing awareness with disbelief. Both are not synonymous. So if not believing because I'm not aware and not believing because I am aware is different and only one is atheism, what is the other one called? The first does not follow the second. One is lack of awareness and the other is a rejection of belief in a deity. So what are these terms called? Lack of awareness and rejection of god, you think only one of them is called atheism, what's the other one called? If you don't know about something, you can't believe in it. QED. But you do need to be indoctrinated in order to acquire a belief. If belief was inherent, we'd all believe the same stuff. Belief is an action done with knowledge. For example, You cannot say you do not believe me without knowledge of what you are contesting. In order for one to NOT believe in anything, one must first be aware of that anything. We all are conceived with tabula rasa. As we mature and experience, that slate acquires knowledge which we assimilate. You contradict yourself. First you state "no human being is born with an infused intellect or conceptual knowledge" then later "no one is born atheist or possesses an absence in belief of God." Since a newborn "lacks intellect or conceptual knowledge" it cannot possess a belief in a "god". Lacking belief in gods is the very definition of athiesm. Thanks for playing. There is no contradiction. You are not reading it in context. You are ignoring the fact that in order to disbelieve in something, a concept must be present that is knowable. In other words, you have to have knowledge of the thing that will be disbelieved before disbelieving it. A newborn does not even know what the word "disbelief" is, how can it be applied period? You are confusing lack of awareness with lack of belief, both are NOT synonymous. A lack of awareness IS a lack of belief. You cannot believe in something that you aren't aware of and atheism is, by definition, not having a belief in a higher power. Spin it any way you wish but that fact remains. To claim otherwise is a bit desperate. No. Lack of awareness means that one is not exposed to a particular concept. It cannot register in cognition. Lack of belief means that one is aware of a concept, registers it and decides that it is not believable. See the difference? "Atheism is a social phenomenon and therefore cannot be the default position. It must be learned." No, silly. RELIGION is the thing that is learned or taught. Atheism is simply the lack of it. "Atheism is a social script, not a default of the human condition at birth. No one is born atheist or possesses an absence in belief of God." No one can actively possess an absence of anything, silly. Right here, it's clear you don't understand atheism- you're trying to make it a positive claim (like religion) when it's not. Of course people are born without a belief in gods- they haven't been indoctrinated yet! Atheism is not the "rejection of belief", as you erroneously claim in your comments. It is the LACK of belief. It would behoove you to actually understand atheism better before writing about it. No, atheism is learned. You cannot reject belief in something if you do not know what the something is before you reject belief in it. Do you see how ridiculous your reasoning is? This is a scientific fact. Moreover, apisteou is "lack of belief," not atheism. You seem to be confused on the terminology and this shows why your reasoning is off. Atheism is the default because newborns do not know of any gods, and if they eventually become theists, the god(s) they wind up believing in are those they've been exposed to or those they themselves create. There is no evidence that any person who has not been exposed to the Christian god in any form knows about and worships it. This goes for all other previously created gods. When tribes in South America have been discovered that have never before had contact with the outside world, they do not worship any known deities. Atheism does not mean unawareness. God is a universal concept found in all cultures. We are genetically predisposed to believe in God. To date, no atheist has been able to debunk anything from me or anyone else unless it comes from fundamentalist Christians who deny evolution.